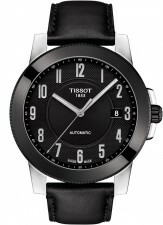 The Tissot Genteman Automatic collection combines style with affordable automatic technology with the new Swissmatic movement with a power reserve of up to 3 days. The shiny and notched bezel with a Clous de Paris pattern and refined details such as Clous de Paris on the dial draw the eye. With the Genteman collection Tissot wanted to create a collection that expresses classicism and masculinity, as well as bringing subtle and distinguished design accents.